KATHMANDU, Feb 20: With a view to fostering political stability through a reduction in the number of political parties, the Election Commission (EC) has proposed a 1.5 percent threshold for parties seeking representation in parliament. A new electoral bill with this provision has been drafted by the EC and forwarded to the government for its endorsement. 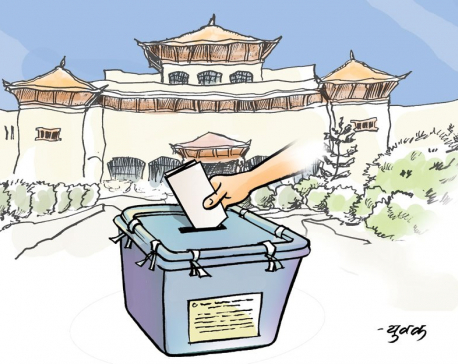 The draft Bill Related to Election of Members of House of Representatives has set out a 1.5 percent threshold provision for parliamentary seats under the proporational representation (PR) category. This is the second time the election body has proposed to tighten up the growing numbers of political parties in the country. In 2013 also the election body had suggested a 1.5 percent threshold for the second constituent assembly (CA) election. The provision was, however, removed following reservations on the part of fringe parties. “They made us backtrack from the threshold provision, saying it was an election for the CA. But this time the threshold should be enforced by any means if democracy is to be strengthened at all costs,” said former chief election commissioner Neel Kantha Uprety. Currently, 110 parties are registered with the EC but only 30 of them are represented in parliament. Experts say the number of parties could be reduced to nine at the most if the 1.5 percent threshold is enforced. Former election body chief Uprety had stressed a 3 percent threshold provision for the upcoming elections, saying Nepal does not need more political parties. “If you look at our political parties they can easily be categorized into three: rightist, leftist and centrist. So why do we need a maximum number of political parties?” he asked. Along with the threshold provision, the EC has proposed ensuring 50 percent women representation under the PR category. The draft bill forwarded to the Home Ministry by the EC has also introduced a None of the Above (NOTA ) provision, following a Supreme Court order to ensure a right to reject provision for the upcoming elections. The draft has likewise proposed barring anyone from contesting from more than one constituency. Earlier also, various stakeholders had suggested to the EC to bar anyone from contesting more than one constituency, as the EC had to conduct a by-election when someone wins from more than one constituency. By-elections were conducted in four constituencies in the CA election of 2013. According to clause 7 of the draft bill, at least 50 percent women candidates must be maintained under the PR category and one-third of a party's candidates for First Past the Post (FPTP) should also be women. Similarly, the bill has provisioned ensuring at least 33 percent women representation in parliament from each political party. The EC has also proposed that candidates from provinces where more votes were secured should be given priority while picking lawmakers under the PR category. Changing the existing provision requiring the submision of a deposit for filing a candidacy, the EC has proposed Rs 10,000 as candidacy fee for each candidate under the FPTP category. 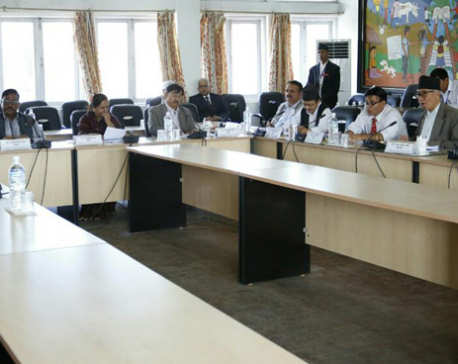 It has also proposed 50 percent concession in the fee for women, Dalits and the poor filing candidacy under FPTP. The draft further proposed barring political parties and candidates not submitting their election expenditures in the 2013 CA election from contesting the upcoming parliamentary election. Likewise, political parties already represented in parliament will get election symbols for the upcoming elections but only national parties will get the symbols from the next elections. Meanwhile, the EC has also forwarded a Bill Related to Election of Members of Provincial Assembly to the Home Ministry for revision and registration with parliament.